The combination of supercharged usable power and comfort is genius. There is arguably no faster way to travel around Europe in comfort. 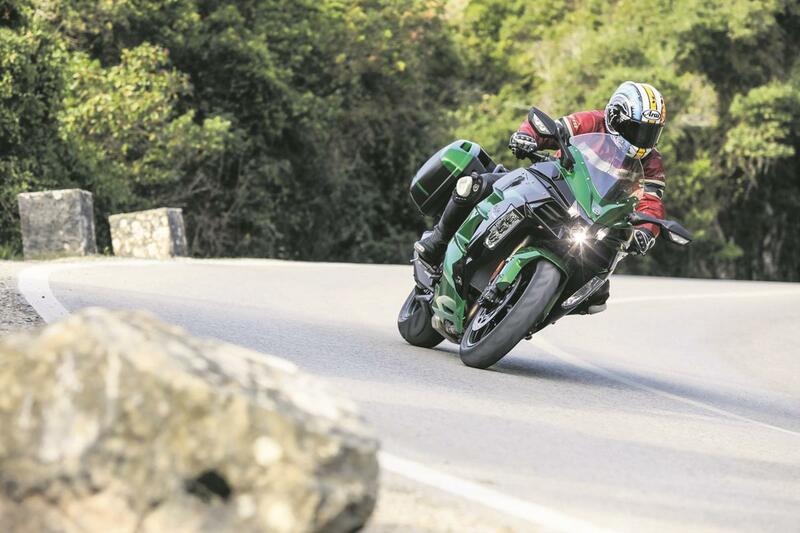 Behind Kawasaki’s impractical H2, it’s the king of the Autobahn. Heated grips, cruise control, cornering ABS and full colour clocks, it’s practical; yet at the same has the mid-range tyre-ripping grunt to take your breath away – love it. On the road, the H2 SX falls a little short. Yes, the fully-adjustable suspension is impressive, its ride quality is excellent, you’re never jolted out of the seat and the front doesn’t dive for cover when you apply the brakes. For the majority of the time the H2 SX performs as you’re expect a 260kg sports tourer to behave. . The handling questions that arose on the road weren’t an issue on track. With heat in the Bridgestone rubber, and the suspension tweaked for the track, the lack of front end feel wasn’t significant. On long, sweeping corners the H2 SX was unfazed and predictable. Ground clearance was impressive, as was the rear end grip. While the electronics do a remarkable job of dealing with so much power and make the power accessible. 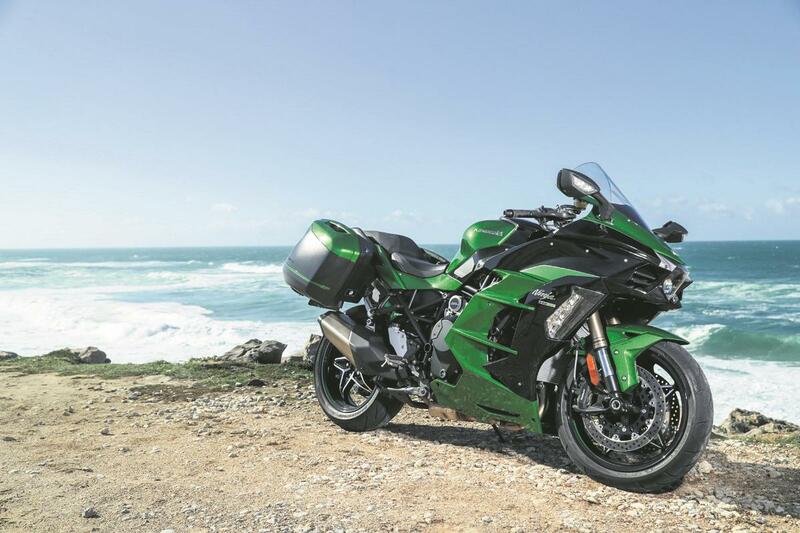 Yes, the H2 SX is certainly more tourer than sports, it doesn’t have the agility of the Z1000SX, but for a big comfortable bike it wasn’t fazed when asked to perform outside its design window on track. The H2 SX has the same 998cc capacity as the H2 and the crankcases are the same, otherwise it’s an entirely new engine. 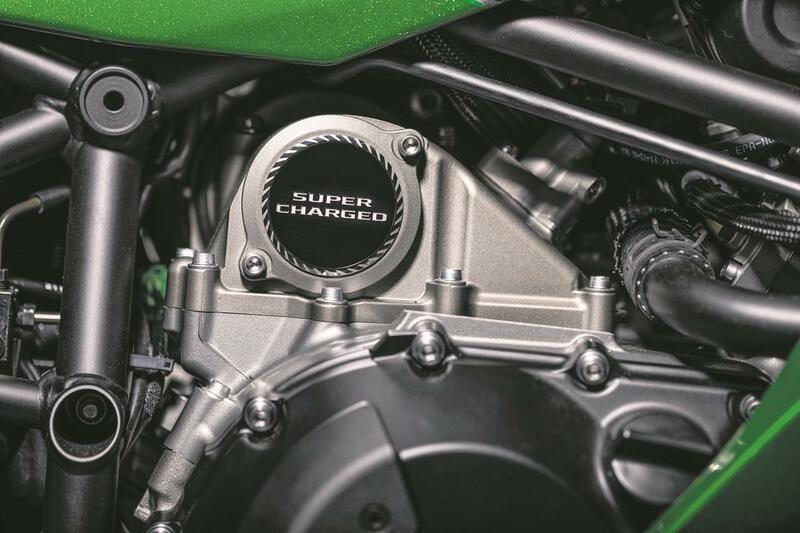 Kawasaki refer to the H2 SX as the second generation of its supercharged engines, after the H2/H2R and have striven to create what it calls a ‘balanced supercharger’. In other words, while with the H2 the primary goal was total performance, with this H2 SX Kawasaki is trying to balance performance and economy. 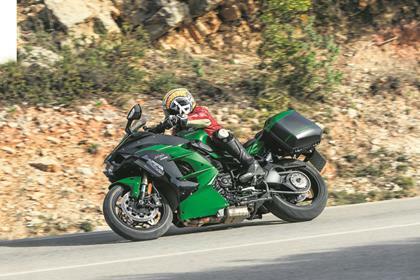 As a result, the new engine has been designed to offer more low to mid-range power than the H2 while Kawasaki is also claiming similar mpg figures for the H2 SX to that of its already frugal Versys 1000. The supercharger’s impeller and intake system is new. Although the impeller is the same size, the shape and angle of the blades have changed. The intake chamber has been revised, as have the intake funnel lengths. Throttle valves are smaller, from 50mm to 40mm and cam profiles now have a shorter intake and exhaust duration. 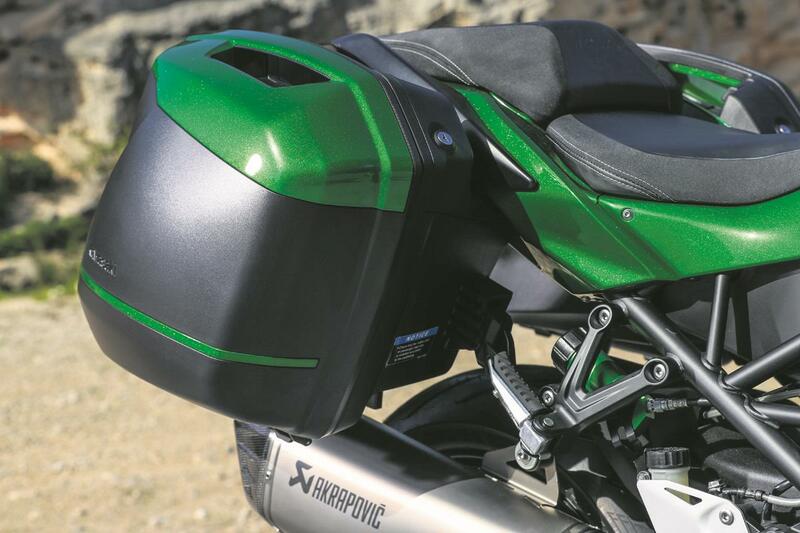 Kawasaki has also revised intake and exhaust ports. The exhaust is all new, too, with smaller diameter header pipes and a shorter, more compact silencer and as a result is 2kg lighter than the H2 item. The end result is: 207bhp with ram-air, improved low to mid-range power and 25% more fuel efficiency. And it still chirps. The H2 SX is loosely based on the proven supercharged H2 and H2R. The supercharged engine has been de-tuned, therefore isn’t highly stressed and we’ve not heard any stories about the H2 or H2R. Kawasaki’s level of finish is very high. The base model shares the same engine, chassis and rider aids and is 4kg lighter. However, you don’t receive the new TFT clocks or the extras. If you want TFT clocks, cornering headlights, launch control, quick-shifter with auto blipper, centre stand, heated grips and a larger screen then you’ll have to dig deeper into your pockets for the SE model. There are three switchable power modes, Full, Medium and Low, with the latter two reducing power to 75% and 50% respectively. The traction control system has three settings and is fully integrated into cornering ABS system. There’s a quickshifter/auto-blipper which negates the need for the clutch during gearshifts and there’s even launch control. That said, the suspension isn’t semi-active or electronically adjustable, as some were hoping, although both ends are fully-adjustable and there’s an easy-access remote pre-load knob at the rear. The H2 SX’s cornering headlights are also a first for Kawasaki. Via a Bosch management system, three lights per side illuminate in relation to lean angle. Clocks and switchgear are also bespoke and based around another Kawasaki first – a central, full colour, TFT dash. You can change the background colour and layout, while cruise control comes standard, as do heated grips on the SE model. Rear brake 250mm single disc with two-piston caliper. The base model shares the same engine, chassis and rider aids and is 4kg lighter. However, you don’t receive the new TFT clocks or the extras listed below. 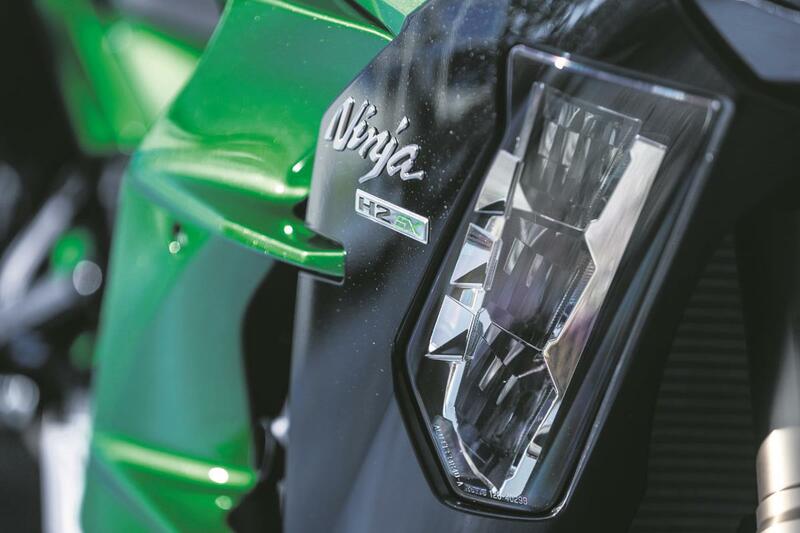 5 owners have reviewed their KAWASAKI NINJA H2 SX (2018-on) and rated it in a number of areas. Read what they have to say and what they like and dislike about the bike below. Like a previous comment, buy a gen 2 (2012 onwards) ZZR1400 instead. 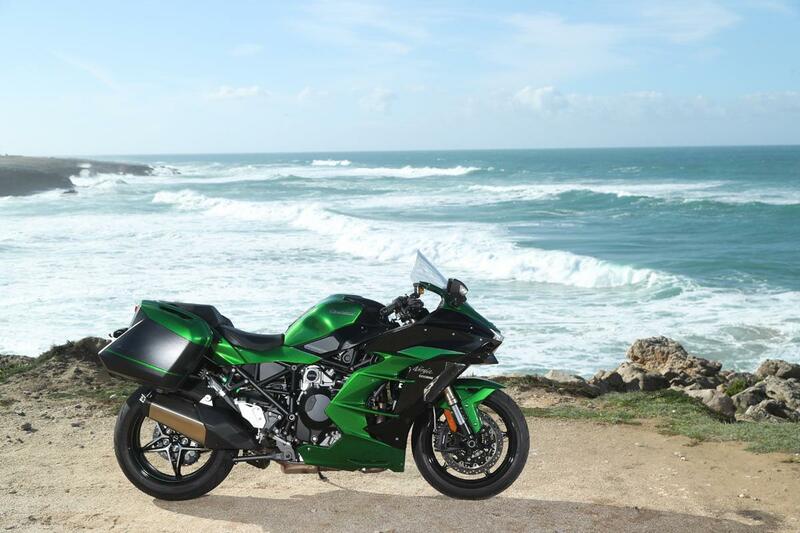 The ZZR1400 is better at everything, more power, faster and much better for touring and especially for a pillion. The H2 SX pillion seat is laughable, unless your other half has the bottom of a 12 year old. The price of the H2 SX is ridiculous and nowhere near worth it. Are all the gizmos added to make it seem worthy of a nice new car price? Maybe. I have now gone back to a ZZR1400. 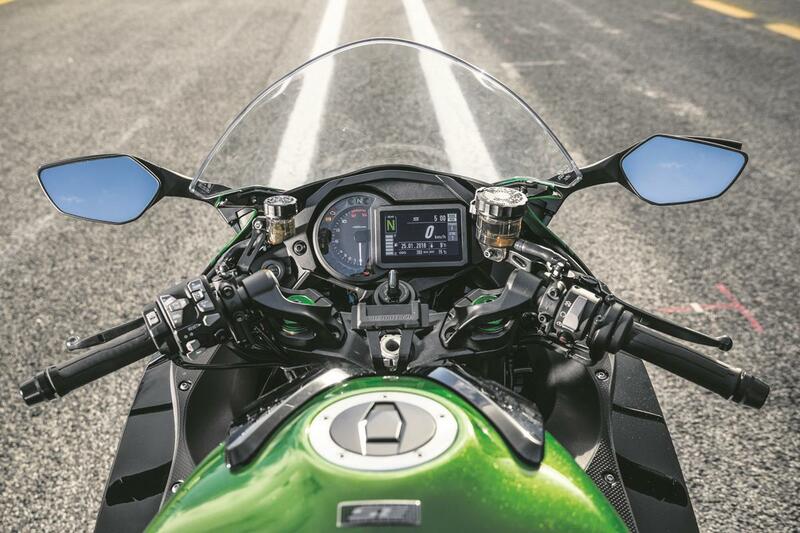 The only thing missing is cruise control, why doesn't the ZZR1400 have cruise control? Kawasaki missed a trick with that, but it is still better than the H2 SX. If they stop making the ZZR1400, I will keep mine for as long as there is nothing better out there. Don't be lured by the word 'supercharger' the hype isn't what you actually get. I can ride my ZZR1400 at least 600 miles in a day, with the H2 SX, nearer 350-400miles a day. Ride quality is ok, but that vague front end is scary at times. Tips in quicker than a ZZR1400, but as they both weigh the same, they corner similarly. Brakes are ok, too. Hmm, being supercharged it pulls from tickover, but, it isn't as fast as a ZZR1400 no matter what anyone says. They maybe a tuners dream, but you could turbo a brand new ZZR1400 and still have change from the price of a standard H2 SX SE, and way more power. The engine isn't anywhere near as smooth as a ZZR1400, either. Quite a let down considering the hype. As with any Kawasaki I have owned, the quality and reliability are second to none. About the same as any other large capacity bike. Plenty of equipment IF you buy the H2 SX SE. Dealer was ok, but then when you are chucking them the best part of 20 grand, they would be nice. It’s a phat sportsbike, the love child of a ZX10R and a ZZR. In a straight line you could close your eyes (metaphorically speaking) and feel a ZZR below you. Throttle and sound is similar. But it tips in more eagerly and that feels very strange and unnerving. This is due to lack of any true tyre feedback. It feels numb and you rely on the bike to look after you instead of relying on feedback from the bike to do it. I really hope a new set of tyre will sort it. Everybody has covered the good stuff about the bike so no more to say here. On tyres again it hideously tracks road lines and tarmac shapes and crowns. Just can’t forgive Kawasaki for these tyres. If you find a totally unrealistic bit of flat smooth tarmac it feels like a magic carpet! I do love the bike as I said the good points people have already covered are awesome. Very awesome. Compared to my MTS 1200 2014 it's a cut above. I don’t think electronic adjustable suspension would improve it. On my MTS I used to switch it from Sport to Tour to soften it. But the throttle on the Kwak is smoother than the MTS sport setting so no need. Who bothered with urban anyway !! Very well put together fit and finish, I’ll be fitting ZZR panels. Reliability — we will see! 3750 is too few miles but petrol usage is lower than a MTS. What else can go on! Very very good with Bristol Kawasaki.  Really great guys. But the factory did leave a bolt off the clutch reservoir. If you want a bike to travel across Europe fast, then buy a ZZR1400. The ZZR1400 is far better at everything, and it is significantly cheaper than the H2 SX SE. The 2012 onwards ZZR1400 has more power and is the same weight give or take a KG or two. No, you don't get cruise control which is a huge miss from Kawasaki, and no you don't get pretty coloured clocks and launch control or even a quickshifter, but bar the cruise control, why are the others needed on a sports/tourer? Wish I had kept my ZZR1400. I shall be going back to a ZZR1400 before the Summer is over. Come on Kawasaki, add cruise control to the ZZR1400. Not bad comfort wise, but I find the suspension very hard. Dialling it all down doesn't make an awful lot of difference. I find I do around the same mileage before a break as my previous bike, a tankful is fine before my knees hurt, but after that I can't go much further and I am used to riding all over Europe. Brakes are ok, they stop you well enough. Well, rubbish compared to a ZZR1400 which is so smooth compared to this, which is more agricultural and low down grunt is crap. Maybe Kawasaki restricted these like they did the original ZZR1400. As always, quality is high with a Kawasaki, but ride through the winter and you need to keep on top of cleaning and servicing like all bikes. Reliability is good with Kawasaki, I had two ZZR1400's over an eight year period with no reliability issues at all. More than 50,000 miles on them and not a single worry. I have no reason to believe that my H2 SX SE will be any different. Value is terrible. £19,000 for this? I was mad, must have forgotten to take my meds that day. Anyone that buys one of these has more money than brains. Only things I have have added are a sat nav and a Fenda Extenda. It has all the bells and whistles, but most of it is to sell them rather than any real world use. Bought from a dealer, he took a kidney and a lung to pay for it. Feels like I was robbed frankly. Ride is superb. You don't feel the extra weight. 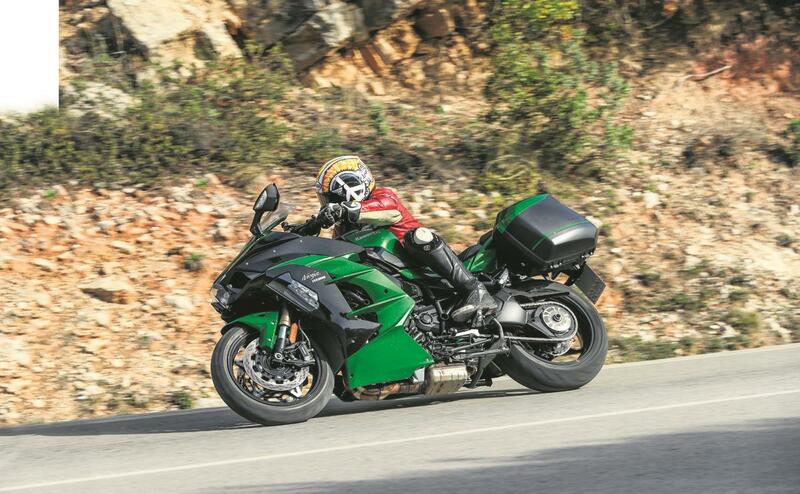 YES, it has been notably restricted by Kawasaki at the expense of making it a touring bike. And more practical. But what does that tell you about the engine? This is the next level from the usual high quality from Kawasaki. Insurance premium be a problem for some. Love the colour TFT! 3-stage Heated grips! Quick shifter was effortless and seamless accelerating above 5000rpm. Downshifting very smooth from 6th down to 5th/4th/3rd. Cruise control very easy to use and works well. Wind protection was also very good. Overall the bike just doesn't live up to the hype. A really nice stable ride, great handling & balance for the style of bike. Worth spending time dialling the suspension to your own taste. Unfortunately it just seems so breathless low down in the range, then when the engine spins up the front wheel wants to lift. Hopefully this is something that will be addressed in future models. Quickshifter isn't the best, needs improvement. TFT display is a bit overrated, not really sure the SE version is worth the extra, all things considered. All good, very helpful dealer.